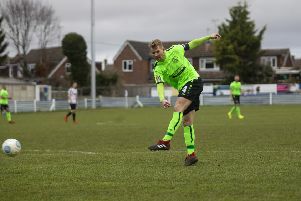 Leverstock Green ended an eight-game winless streak on Saturday as a gritty display saw them come away from Wembley with a 2-1 win and a much-needed three points. The Green side has seen many changes in the last few games, with under-18s and reserves being elevated to the first-team and a couple of new signings on Saturday in Northwood loanee Kerran Lataille and Luis Brooker, from AFC Dunstable’s development side. Wembley, a place above Levy in the league in 14th, are one of the SSML Premier’s form teams, unbeaten in seven games. After soaking up early pressure, it was Levy who took the lead in the 26th minute when Jay Kossifos sent over a dangerous cross from the right touchline, which took a deflection off defender Ethan Tyrer. Wembley keeper Montel Joseph pulled off a great one-handed save to stop an own goal, but the rebound fell for Jamal Howe, who slotted home for his first goal for the club. Green did a good job of holding onto the lead but on 71 minutes Wembley levelled spectacularly. A cross came over from the left and Charlie Weir had his back to goal, but pulled off an acrobatic bicycle kick to divert the ball into the bottom corner. But Levy grabbed a winner in the 79th minute when some good work by Luke Nugent put Reece Cameron through. The latter could have had a shot from a narrow angle, but spotted sub Luke Preedy in a better position and squared it to him. Preedy had plenty of time to pick his spot for a 2-1 win. This Saturday sees Green travel to 16th-placed Harpenden Town.